Flagged down by Sachin Tendulkar at the end of the race, the inaugural Formula One Indian Grand Prix today got off to a spectacular start with one hundred thousand people turning up at the Buddh International Circuit to savour the moment. 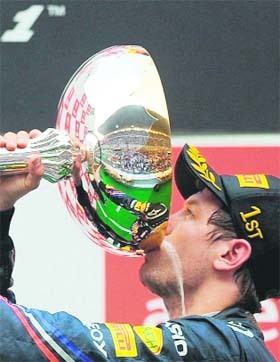 The German double world champion Sebastian Vettel took the crown. This was Vettel’s 11th win this season. He also became the youngest driver at 24 years of age to achieve the grand slam by winning the race, achieving the pole position, completing the fastest lap and by leading in every lap. This was only the second grand slam by any driver in the last seven years. “Awesome”, summed up a visibly overwhelmed cricketer Yuvraj Singh. Watching the Formula One race for the first time, Yuvraj said he did not feel bored and had in fact fallen in love with the sound of the engines. Since the Indian Grand Prix is an annual event, he said, it would be difficult for it to dislodge cricket as the most popular sport. “ But if it is held six times a year,” he added thoughtfully, “ it might give cricket a run for its money”. Amidst criticism that an expensive motor sport like Formula One (JP group spent Rs 2,000 crore to just develop the 875-acre race course and each car is believed to have burnt 15,000 litres of fuel) had no place in India, an Assocham study claimed that Formula One had the potential of generating Rs 90,000 crore and provide employment for several lakh people in the next 10 years. According to one estimate, several thousand people will be required to maintain the track alone. The ubiquitous ‘dust’ on the North Indian plains did play spoilsport but the drivers magnanimously chose not to mention it. The new track and the dust did tend to slow down the cars but next year it could be very different. The death of two drivers, Dan Wheldon and Marco Simoncelli, following crashes on tracks in Las Vegas and Malyasia respectively in the last fortnight, would also have weighed heavily. Jenson Button, who came second today, dedicated the Indian Grand Prix to the duo even as other drivers emotionally recalled their association with the deceased. Present at the race today were the two motor sport enthusiasts, Vicki Chandok and Vijay Mallya, who had raced each other on an improvised track in India way back in 1987. Both played a major role in bringing Formula One to India.